Alpha Driving School - driving lessons from only £7* per hour! (see price list for further information) Newcastle, Gateshead, South Shields and surrounding areas. 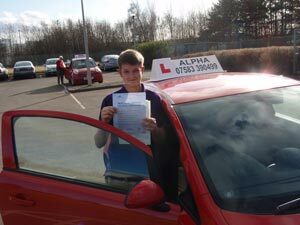 Alpha Driving School is one of the best driving schools in Newcastle, based on our very high pass rate for learners. We are the perfect company to help you learn to drive. Our patient, professional, reliable and friendly driving instructors makes Alpha Driving School the ideal choice for learner drivers who have never driven before or those who have limited driving experience, but have not yet passed their driving test. Using the DSA Approved syllabus our driving instructors rapidly progress your driving development to ensure you pass your test. Please note, WE CAN NOT supply a driving license. If anyone tells you they can, it's a scam. DO NOT SEND THEM ANY MONEY. With a full valid driving license you can progress to a Pass Plus Course. If you haven't driven for a long time, you have lost confidence in your driving ability, or you would like to further develop one aspect of your driving, we offer Driving Refresher Courses . Traditionally, driving lessons in Newcastle and the north east can be expensive, but we can offer excellent, competitive rates with driving lessons from only £7 per hour* (see price list for further information) . As your driving instructor, we offer experience, patience and a friendly manner. We have excellent driving test pass rates with majority of pupils passing first time. Newcastle, Gateshead and South Shields driving instructors who know the local area.